One video from the always amazing SouthFront sums it all up quite well. This 13 minutes will bring you up to speed on the ongoing EU refugee crisis…..
Caveat: I’m a little biased here as I have been the voice of SouthFront and aided in geopolitical assistance to various videos for the SouthFront team for the past two years. Yes…. that is my voice in the video. Enjoy a little Clarity of Signal. SECRET plans to bring up to 500,000 Syrian refugees into the European Union (EU) from Turkey are to be unveiled by Germany this week. According to the Hungarian prime minister, EU and Turkish leaders are set to announce a behind-the-scenes agreement to resettle hundreds of thousands of people displaced by the war in Syria. It is not known how many of the 500,000 will arrive in Britain, but fears have been raised that a significant number could be drawn to the UK by its relatively generous welfare system. It comes just days after the EU agreed a €3billion (£2.1bn) funding package for Turkey in return for their help in stemming the flow of migrants passing through on their way to Europe. Hungary’s PM Viktor Orban warned of a “nasty surprise” for Europeans when the deal is announced in the coming days. He added that EU nations would then be obliged to resettle them, with “intense” pressure to take in quotas of newly-arrived refugees. Hungary has firmly resisted the idea of resettlement quotas to distribute more evenly the migrants, most of whom wanted to go to Germany or Sweden. The agreement was reportedly floated at the recent EU summit in Malta but was abandoned and not included in the multi-billion pound EU-Turkey agreements signed at the weekend in Brussels after diplomats failed to gather the necessary support for it. UKIP defence spokesman Mike Hookem MEP told Express.co.uk the plans were “utterly unacceptable” and Europe’s citizens were “being deliberately kept in the dark”. 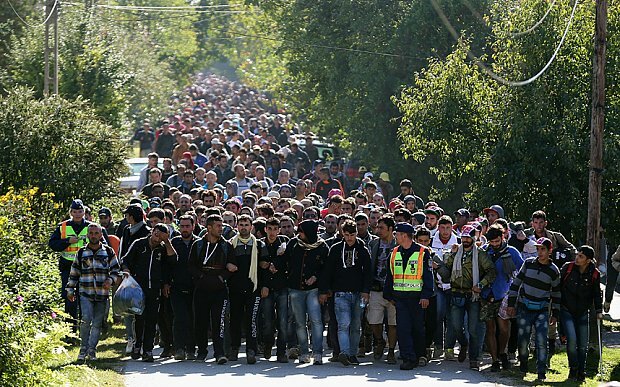 “Poll after poll shows that immigration is the number one concern for voters in the UK and people in other EU countries are also upset at the number of migrants being foisted on them by foreign leaders. Germany’s population is no longer shrinking. Four consecutive years of increasingly high net migration have outpaced the country’s birth deficit, taking the country’s population to nearly 82 million people – a level last seen in 2009. The population growth has been particularly concentrated among those of working age. The number of people employed in Germany hit 43 million in 2015, according to data released by Destatis, the German statistics office, on Tuesday. The figure represents the highest number of people in work since German reunification. Meanwhile, the number of unemployed people has dropped below 2 million for the first time since the fall of the Berlin Wall. Over the past 12 months the active labour force (the total number of people in employment and unemployed) has increased to 44.9 million, driven by higher labour force participation of the domestic population and the immigration of foreign workers, which has offset negative demographic effects. Net migration has exceeded 300,000 every year since 2011, hitting 676,730 in 2014, according to data published by Germany’s federal office for migration and refugees.